PB: One thing about your work that has caught my attention is the addition of supplemental appendages to some pieces. In your statement, you’ve referred to these as “nets to capture and manipulate light and color,” and I think that line really shows just how experimental your work is. Can you elaborate on this aspect of your paintings and what’s on your mind as go about working in the studio? AK: The additional elements that I use to stretch outside of the painting are like appendages! I like that. They gesture out to the viewer. The space around the painting is included, and the painting breaks a little free of its format. The shadows that are created by the work are implicated. I do this because I can’t tell what the art is—is it the object, or the art coupled with activity around the object that is most interesting? 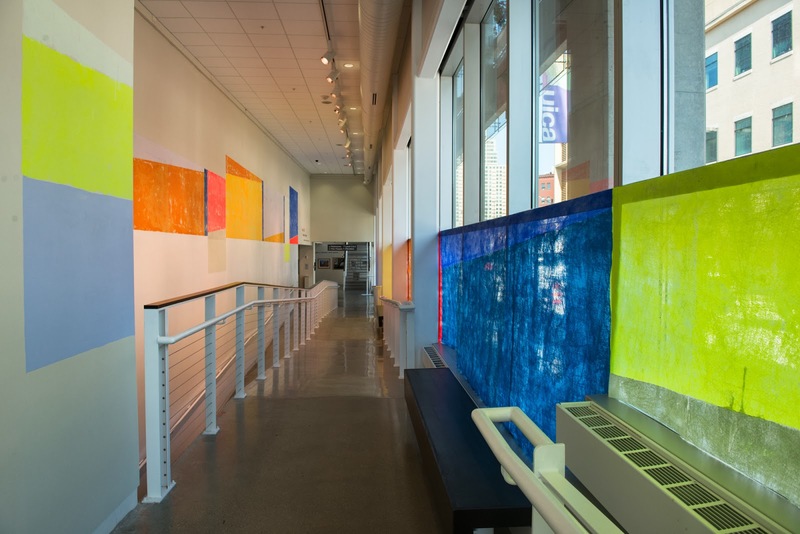 The conversations, the movements, other outside elements near the work, etc… The “nets” are transparent elements that can filter color and light and cast those ideas out into the space. I think a lot about non-containment and also about how the work can breathe and be ever changing. In taking color and experience as my subject, I’m thinking about it as an organic ever-changing element and how I can reflect the body either on or through the paintings for that reason. PB: What kinds of technical considerations or snags have you experienced while trying to break new ground? AK: Well… so many things. For instance, the reason to use such materials and what those material histories might add to the work; the logistics of suspending work—the how or all of that; and then the questions of presenting and re-presenting the more or less ephemeral aspects of my work. Documentation has to be specific when architectural space and natural light are part of the work, and using reflective paint can be difficult to photograph. Sometimes the documentation of the work offers more possibilities than the work itself, and there’s also the question of how to put experience into the smaller objects and ask them to function the way the installations do. From a market perspective, the biggest snag of course is how to sell work that depends a lot on daylight and scale. PB: As far as other artists are concerned, past and present, whose work has influenced or impacted you? AK: I have an attitude about art that is based on my total awe of human innovation and creativity, so I find things wonderful and curious in anything that anyone makes. I tend to love the artists who have concentrated on experience and who make work that language doesn’t have an easy time of explaining. Work that combines the spiritual and the humorous, or the poetic with chance and awkwardness, always mirrors humanity in a timeless way. PB: What are your top five art books that you can’t do without? AK: The ones I carry around a lot and read and re-read on the train: Seeing is Forgetting the Name of the Thing One Sees, Tantra Song, Kant after Duchamp, the Dhammapada, Donald: Judd Colorist, What Color is the Sacred?, and The Last Whole Earth Catalog. PB: What’s coming up in the near future for your work? 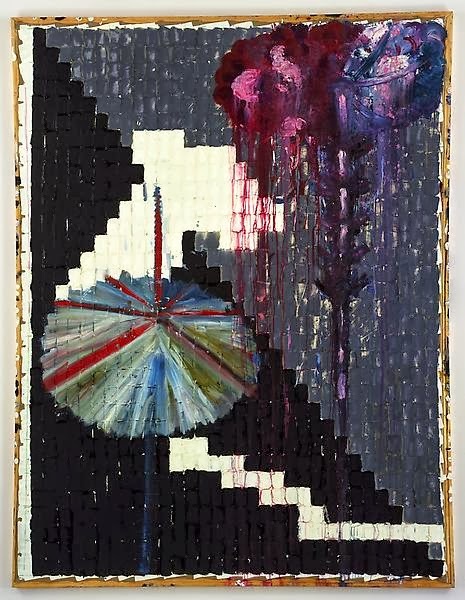 AK: I hopefully have a project with the Rhona Hoffman gallery here in Chicago at some point, and I am part of TSA gallery’s flatfile program in Brooklyn. Sabina Ott has curated a show I am included in later this year. I just took down an installation that was at UICA, an amazing space in Grand Rapids, MI in the Chroma show. I am working on a commission for a program at the Hyde Park Art Center in Chicago and I’ll be exploring multiple suspended fabric pieces and possibly incorporating light in new ways.